SOUTH BEND, Indiana — With its 1-0 loss to the No. 10 University of Notre Dame on Saturday at the Compton Family Ice Arena, the No. 9 Boston University men’s hockey team squandered the opportunity to finish in the top four of the conference — and instead dropped to fifth place in the league, losing out on a first-round bye and home ice in the quarterfinals. Had the Terriers (19-10-5, 12-6-4 Hockey East) finished with one more point than No. 11 University of Massachusetts Lowell in the season standings, BU would have secured a top-four seed. 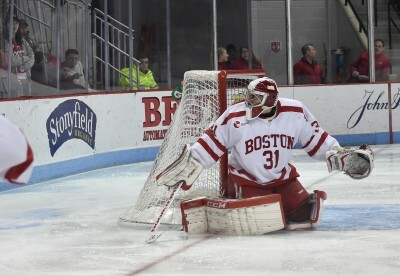 Lowell (21-8-5, 12-6-4 Hockey East) began the evening two points behind the Terriers, but earned a 3-1 victory over No. 2 Boston College on Saturday, giving both BU and the River Hawks 28 league points. By way of having a better record against the No. 1 seed — Saturday’s win against BC (24-5-5, 15-2-5 Hockey East), a team against which BU did not earn a victory during the regular season — Lowell earned the tiebreaker and secured the fourth-place spot and a first-round bye. Now, BU will be playing at Agganis Arena next weekend, in a best-of-three series against bottom-seeded University of Massachusetts Amherst. “You’re hoping to get a point tonight, allow yourself to get a bye, but it didn’t happen,” said BU head coach David Quinn. Besides BC and Lowell, No. 5 Providence College and Notre Dame (19-8-7, 15-5-2 Hockey East) finished with the second and third seeds, respectively, also to earn home ice and a first-round bye. After the loss to the Fighting Irish to close out the regular season, some of BU’s players noted how useful the bye week could have been. “We’ve just got to recharge, and we still got a lot of hockey left, hopefully,” Lane said. BU and UMass (8-22-4, 2-16-4 Hockey East) will be one of three first-round matchups. Sixth-seeded Northeastern University will host 11-seed University of Maine, the 10th-seeded University of New Hampshire will travel to seventh-ranked Merrimack College, and the University of Connecticut will play the University of Vermont in eight- vs. nine-seed action. Should BU advance past the first round, it will emerge as the highest seed from the first round and will travel to Lowell for a best-of-three quarterfinal round. Quinn said that while the bye week would have been advantageous from a rest standpoint, it doesn’t make the upcoming games any different.